If you are one of those users who like to achieve more with their Android device than just the normal stuff everything does, then you know what TWRP is and most probably worked with it. If you have unlocked the bootloader, you must have installed TWRP recovery because, with TWRP recovery method of unlocking, you can still enjoy the unlocked bootloader advantages. If you have not, you should install TWRP first before proceeding further. TWRP replaces the stock recovery every Android device comes with and hence, you get a lot of new options that were never available. TWRP recovery provides you with the option to flash your device with Custom ZIP files and take the potential of your device to the next level. 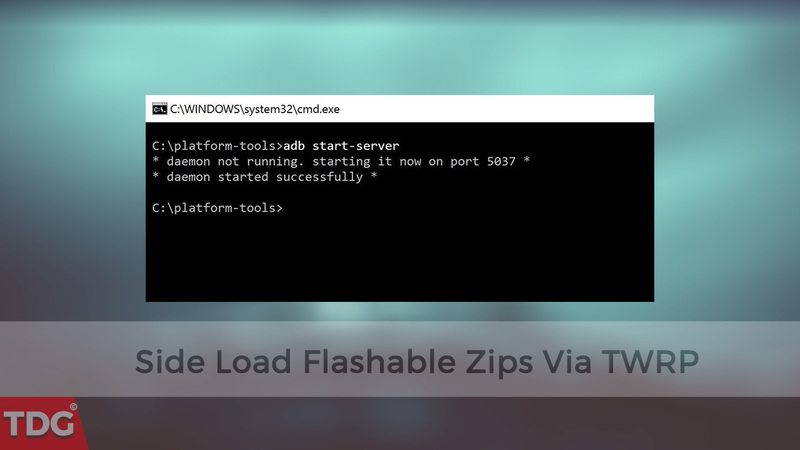 With ADB Sideload flashable ZIPs, you can install the files directly from your computer without transferring the files to the internal storage of your Android device. Furthermore, this sideload feature will help you to recover your device when you have messed up everything and your device fails to boot up. Hence, it is the most popular custom recovery tool available for Android. 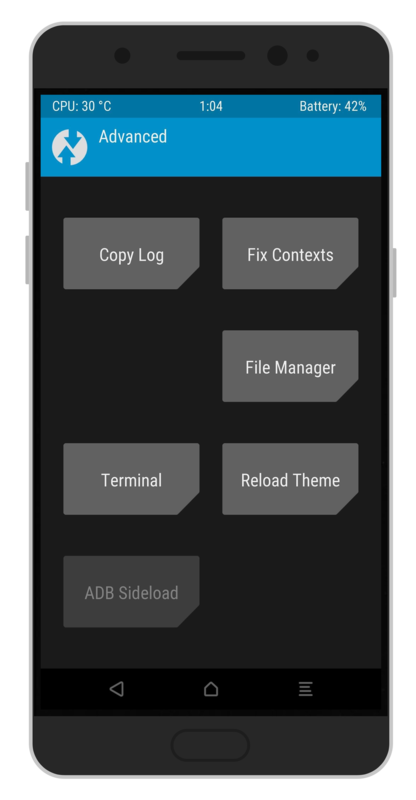 In this article, we will show you how to sideload flashable ZIPs on Android with TWRP. You need to take a full backup of everything on your device. You need to have 60% battery charge. Install TWRP if not already installed. Keep a flashable ZIP file to sideload. TheDroidGuru.com will be not responsible for any damage that happens to your device while performing the sideload process and hence, you should proceed at your own risk. Step 1. Boot your Android device with TWRP and then connect it to your computer via USB. Step 2. Go to ADB and Fastboot folder and open a command prompt. You can type cmd on the address bar to do so. Step 3. In the command prompt(Terminal for Mac users), type the following command and press Enter. Step 4. Once the server starts, find and tap on the Advanced button in the TWRP menu on your phone. Step 5. In the new screen, tap on ADB sideload button and swipe the prompted swipe bar on the screen. It will start the adb connection. Step 6. Now, you have to sideload the zip file by typing adb sideload and give a space and then type the complete location of the zip file within quotes.For Example, if you want to sideload a zip named lockscreen-db_removed-signed.zip , then follow the command below and hit enter. The flashing process will start and depending on the file size, the duration will vary. Once done, you will get a message of completion. Then tap on the Reboot System button on your device. OnePlus Withdraws Oxygen OS 4.5.7 and Rolled Out OxygenOS 4.5.8 For OnePlus 5 – How to download?